Body parts belonging to murdered journalist Jamal Khashoggi have been found, according to Sky News sources, who added that he had been "cut up" and his face "disfigured." With no photographic evidence to support the Sky News sources' claim, gruesome and unverified images of body parts – supposedly Khashoggi's – have been making the rounds in Arabic media. The sources' claim echoes a statement by Doğu Perinçek, leader of the left-wing Vatan party on Monday night. Perinçek told Turkish television that Khashoggi's "body parts" had been recovered from a well in the Saudi consul's garden, and added that President Recep Tayyip Erdogan would explain the findings later on Tuesday. The news comes after Turkish President Recep Tayyip Erdogan demanded Saudi officials reveal the whereabouts of Khashoggi's remains, after the Saudi government admitted Khashoggi had been murdered, albeit in a "fist fight" with officials inside the consulate in Istanbul. Speaking before the Turkish parliament on Tuesday, Erdogan said that "the evidence we have so far collected indicate that Jamal Khashoggi was slain in a vicious, violent murder," planned in advance by the Saudi government. Turkish sources have mainteined from the start that Khashoggi was tortured, killed, and dismembered inside the consulate, and claim to have audio recordings of the journalist's final minutes alive. According to Erdogan, the individuals named by Saudi Arabia as suspects in the murder are also the same as those identified by a Turkish investigation. Ankara is now particularly interested in a claim that a Turkish party was involved in the disposal of Khashoggi's body after the murder and wants to bring that person to justice. But it was up to the Saudis to identify this "local co-conspirator," the Turkish leader argued. A raft of recent revelations seem to lend support to the Turks' theory that Khashoggi's murder was a pre-planned hit. 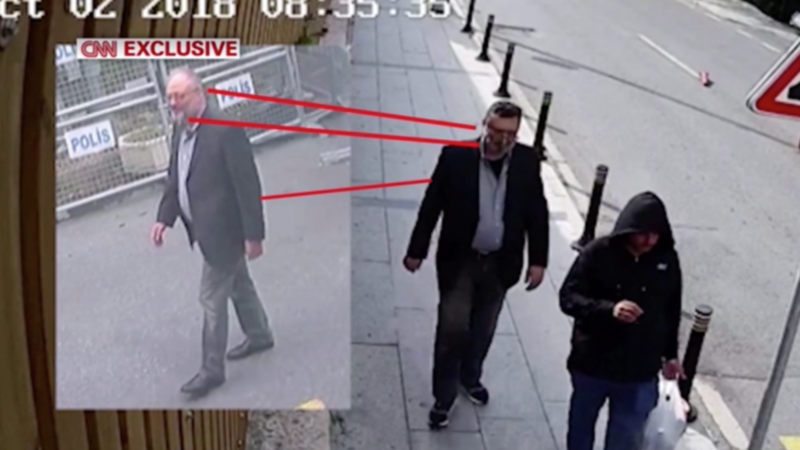 A Turkish source shared CCTV footage with CNN showing a body-double leaving the consulate building in Khashoggi's clothes, moments after the killing. Leaving through the back door, the doppelganger is seen wearing a fake beard and glasses to appear more like his alleged victim. Hours before the killing, the man is seen entering the building in his own clothes, without the beard and glasses. Further reports in Turkish media have claimed that Saudi Crown Prince Mohammed bin Salman actually phoned Khashoggi and tried to convince him to return to Saudi Arabia. The journalist declined the prince's offer to fly to Riyadh, thinking he would be arrested and killed there, and was then murdered by the Saudi hit-team after the talk with MBS ended, the paper, pro-government Yeni Safak, wrote. So much fuss about one dead journo whilst 100's of children die every day in Yemen courtesy of our allies the Saudis. Where is the outrage about that in the MSM??? Six months after the prominent Saudi journalist, Jamal Khashoggi, was killed, Al Jazeera reconstruct what three Turkish journalists believe happened behind closed doors at the Saudi consulate in Istanbul. Their book, Diplomatic Atrocity: The Dark Secrets of the Jamal Khashoggi Murder, is said to be based on Turkish intelligence.